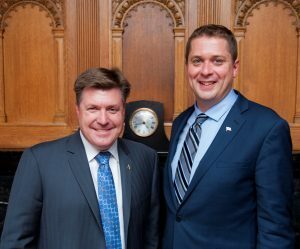 On Wednesday, August 30, 2017 Andrew Scheer, the leader of the Conservative Party of Canada, named Pat Kelly as the Shadow Minister for National Revenue. Elected to Parliament in October 2015, Pat Kelly previously served as the Official Opposition Deputy Critic for the Treasury Board. During his first term in office, Pat tabled a Private Member’s Motion (M-43), asking for the establishment of an enforceable duty of care between the CRA and Canadian taxpayers. This motion drew attention to the need for remedies in extraordinary circumstances, and was defeated by the Liberal government and the NDP. Pat Kelly looks forward to serving Canadians in his new capacity, and appreciates the trust Andrew Scheer has placed in him.